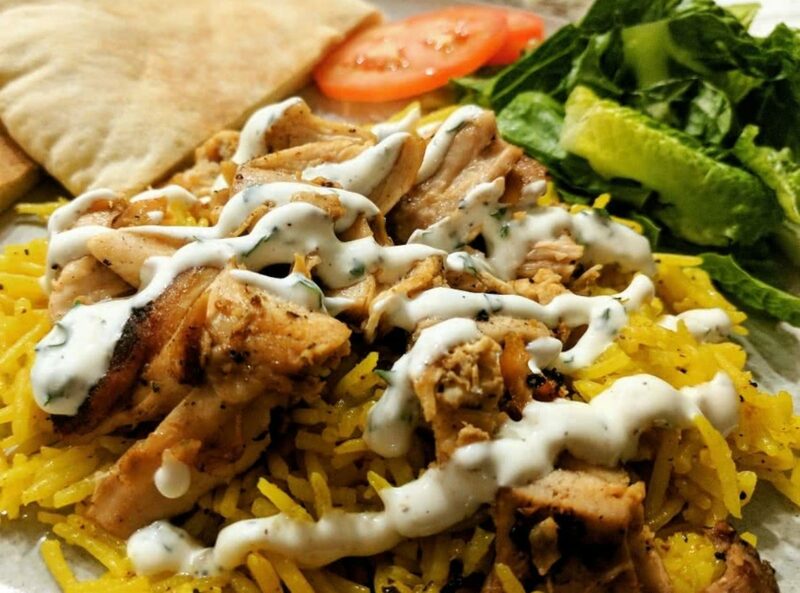 This is a meal we make when we are craving a Mediterranean or Halal dish from one of our favorite fast-casual restaurants in downtown Chicago, but we don't want to go out for it. The grain and salad bowl combination hits the nail on the head in terms of being satisfying, comforting, and all around delicious. With a balance of healthy fresh vegetables and the well spiced rice and chicken, this makes a weeknight dinner anything but boring! Omit the sugar entirely. Use 3/4 Cup of yogurt and 1/4 Cup mayo. Use 2 Tablespoons of lemon juice. 1 teaspoon of white vinegar. We like to top this dish with hot sauce and parsley or cilantro to taste. It is also great with a dollop of hummus and a sprinkle of feta cheese to elevate it to the next level. Substitute in romaine lettuce and add cherry tomatoes. Make the Halal White sauce ahead of time to get all of the flavors to meld. The sauces gets better as it sits, and can be used on other dishes besides this one to mix things up. We skip the chicken recipe on the Serious Eats article and substitute in the Tori Avey recipe. We have successfully used both chicken breasts and thighs, but prefer to use all dark meat for a more flavorful dish. The chicken can marinate for 1 hour or up to 24, we have not noticed a flavor or texture difference. Finish the chicken in a cast iron skillet to get a nice texture to the meat, an ever-so-slight crispy outside to a tender and juicy inside. For the marinade, we reduce the cinnamon to 1/8 of a tsp due to personal taste and so that the cinnamon doesn't overpower the marinade. We also up the cayenne to 1/4 of a tsp to make the dish a bit more spicy.